Victory - Trusted with classics by Logan, Bailey, Lane, Couldrey, Landis, Sparkman and Stephens, Herreshoff, Palin, Lidgard, Townson, Young and other designers. Victory A8, like Rawene, is one of the smallest of the A Class keelers, 38ft overall and only 28 ft on the water line. Victory was owned by H J C George who with his brother Capt G George has raced her for many years. 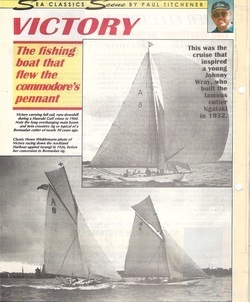 Victory was launched from Logan Bros' yard in 1906 as a gaff cutter for Mr Jagger who leased her for fishing in the Hauraki Gulf. A fisherman Mr Joe Winter who gained some notoriety in those days owned Victory until his death as a result of a fall on Victory's deck while at Great Barrier Island. After this Victory was laid up for a period at Whitianga in Mercury Bay. Mr T M Alexander purchased her soon after the First World War and Mr H H George acquired her in 192o and she was raced first by Mr George Snr then by the two sons together and later by Mr Harold George. Victory won the first race for the Balokovic Cup. A full NE gale was blowing and while other competitors sought shelter Victory carried on and won by more than a day. Further proof of her suitability for ocean racing was provided in 1951 when she battled the heavy wind and sea to win the Xmas cruising race to the Bay of Islands. In 1928 the George brothers took Victory on a cruise to Norfolk Island, completing the 1200 miles voyage in 9-1/2 days sailing time. A former Governor General Earl Jellicoe sailed and raced Victory while Mr George Snr was alive. Lady Jellicoe and her daughters were on board the yacht when Mr George collapsed and died as the result of a heart attack. Victory now wears the bermuda rig but will soon be restored to the original gaff cutter rig, and original low profile cabin top and cockpit. The week-end cruise arranged for members of the Officers' Club by the RNZYS proved most enjoyable. Twenty-three yachts belonging to the Squadron took part in the Devonport Yacht Club race to Matiatia and, after everything had been made snug for the night, members and guests made their way onboard the Victory, owned by Mr. H.J.C. George, Commodore of the Squadron. Mr. George, Mr. K. Draffin, vice-commodore and Dr. F. Macky, were each presented with a silver tankard by the Officer's Club in appreciation of the outing arranged by the squadron. The Victory had such a crowd on board that her counter was almost awash and a count revealed that there were 90 yachtsmen and officers present. 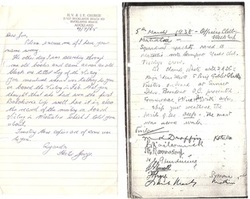 Click image to see the original logbook with the signatures of all those on board. 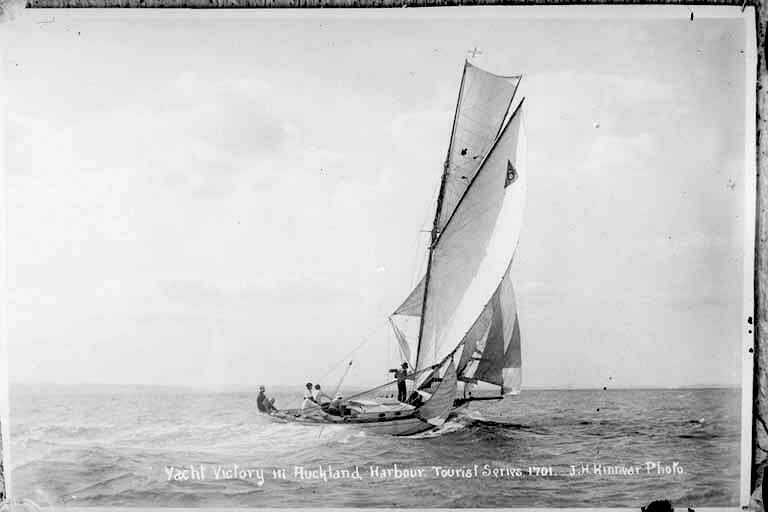 1911 NZ Yachtsman, "The Cruise of the Yacht Victory"
Stay pickled till we're ninety-two!"